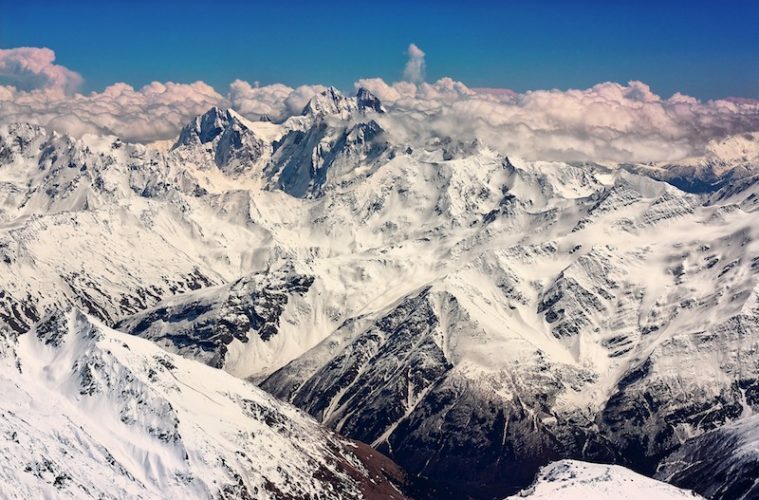 If you want to bag Europe’s highest mountain, you’ll have to swerve the French Alps, because it’s actually Russia’s mighty Mount Elbrus, a 5,642m peak that sits some 800m taller than Mont Blanc. With rounded summits and easy-angled snow slopes, to many it’s the ‘Kilimanjaro of Europe’ – a tough climb, but one that’s also within the reach of mere mortals. However, it’s also not a challenge to be underestimated. 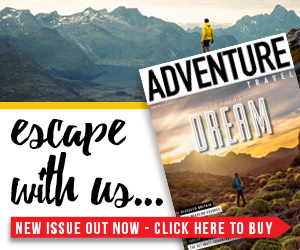 It might make for an attractive ‘tick’, but volatile weather, no-frills infrastructure and sapping altitude sickness can quickly turn an apparent ‘snow plod’ into something altogether more serious. Mount Elbrus has a lot going for it. First off, it’s one of the ‘Seven Summits’ – the peaks that make up the highest points on every continent, sharing billing with the likes of Everest, Denali and Aconcagua. It’s also an extinct volcano, adding another element of excitement into the mix. 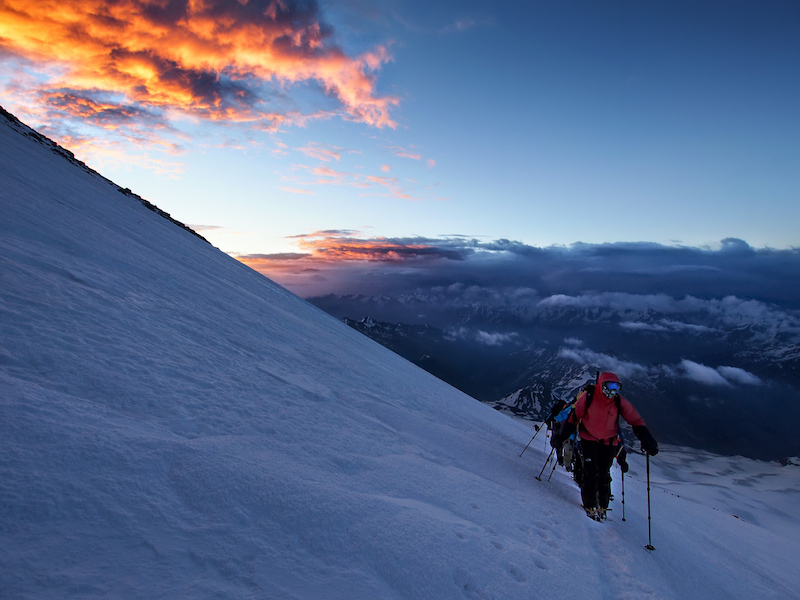 Mount Elbrus sits between the Black Sea to the west and the Caspian Sea to the east. And those big bodies of water have a serious impact on the weather. 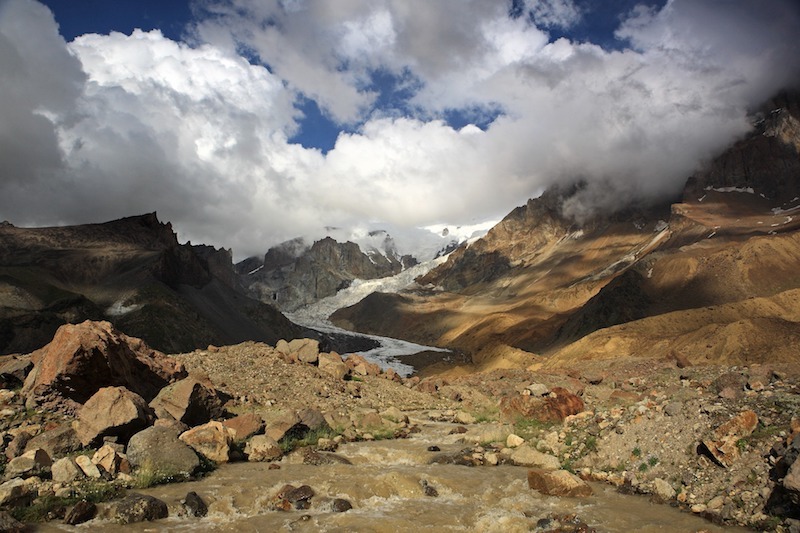 Mount Elbrus is prone to violent, sudden storms and extreme cold. It also can and does claim lives – around 15-30 climbers, skiers and snowboarders die on the slopes each year. It’s a significant mountain and you have to give it the respect it deserves. The upper reaches are extremely icy, so you need to know how to use an ice axe and crampons, and how to arrest a fall. And even in the summer, night-time temperatures on the mountain dip to an average of around -8C. The climbing season on Mount Elbrus runs from May to September and a full ascent will typically take between four to five days, providing you get a good window of weather. Most climb it via one of two routes. The first, the more remote and peaceful option, starts to the north of the mountain, and winds from the valley floor up through green, rolling hills. The second, and more popular, option is to ascend from the southern Baksan Valley, where there’s a small, basic ski resort near the villages of Chegget, Terskol or Azau. This is where it can go wrong. If you plan to tackle the mountain on your own without a guide, do you know how to move confidently on snow and ice and have good crevasse rescue skills? Can you navigate in a whiteout and do you know how to acclimatise properly? If not, stay safe and go with a good, reputable mountain guide. And even then, make sure you’ve done plenty of winter hill walking with a heavy pack to prepare you for the experience. 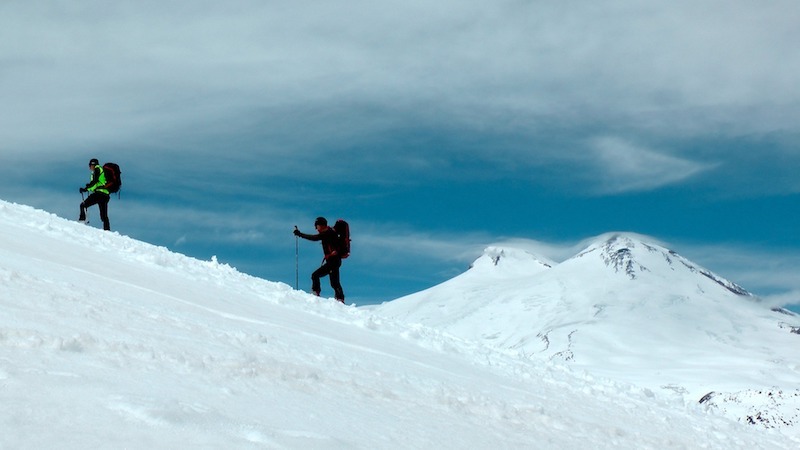 Mount Elbrus is described as a ‘hike’, but that’s only accurate until something goes wrong. 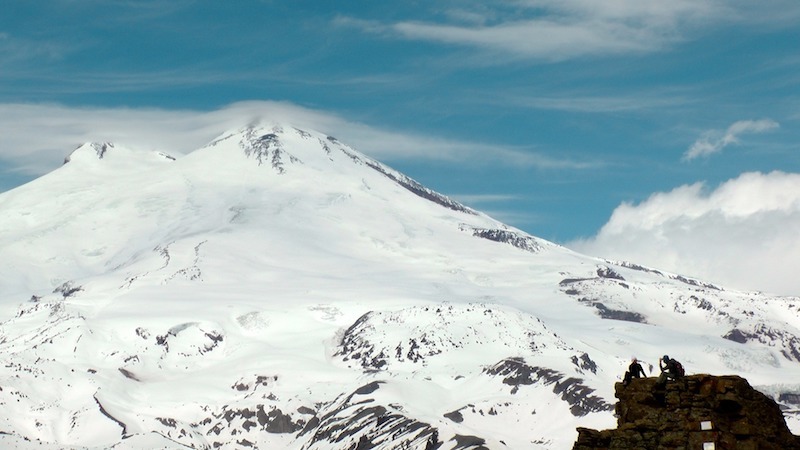 What is the best way to climb Mount Elbrus? If you’re coming from the south you can take the chairlifts up to around 3,845m – already a good chunk of the way up the mountain. 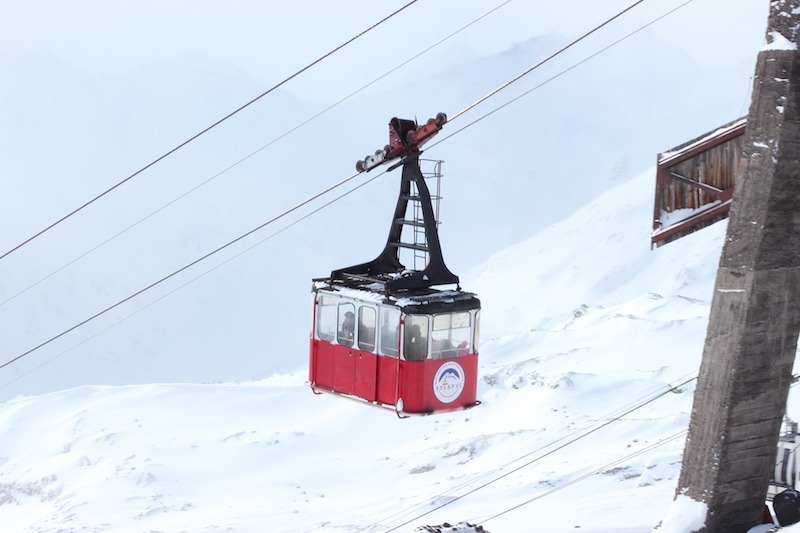 A snowcat service can then take you even higher, up to around 4,200m. But for me, it’s kind of cheating. My advice would be to ditch the snowcat, save your roubles and walk instead. The more plodding you do, the better acclimatised you’ll be and the better prepared for your summit bid. Put simply: this is not the Alps. If you’re expecting cozy chalets and mulled wine, think again. Lower your expectations – the Russians do things differently. That doesn’t mean it’ll detract from the experience, but the infrastructure, including the mountain huts, is very, very basic. Plan accordingly. What is the best way to deal with the altitude? People have a tough time on Mount Elbrus because they try and head straight up without acclimatising properly, risking life-threatening conditions like pulmonary or cerebral oedema. 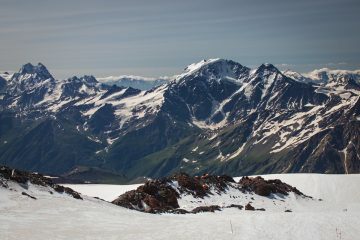 And the thing is, the Caucasus is home to lots of other tempting peaks nearby – such as Cheget Peak (3,450m) to the south. 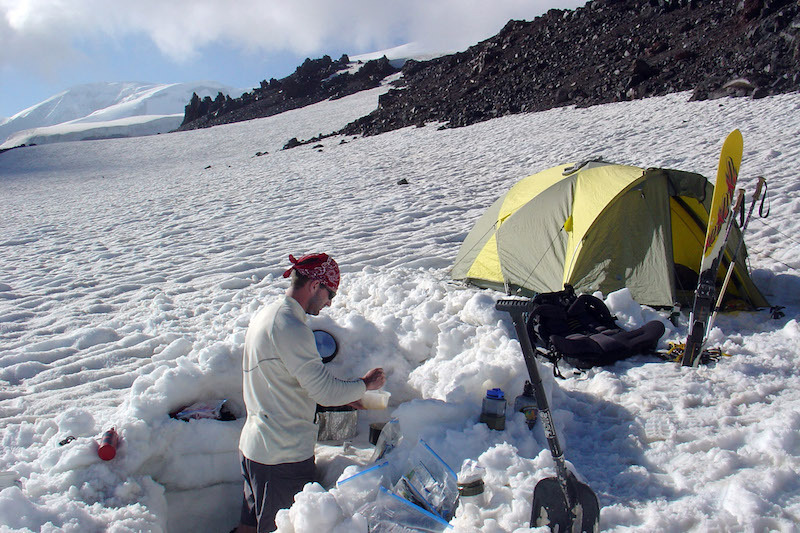 Book a few more days holiday, go and explore the area, get yourself mountain fit, and then shift camp to Elbrus. 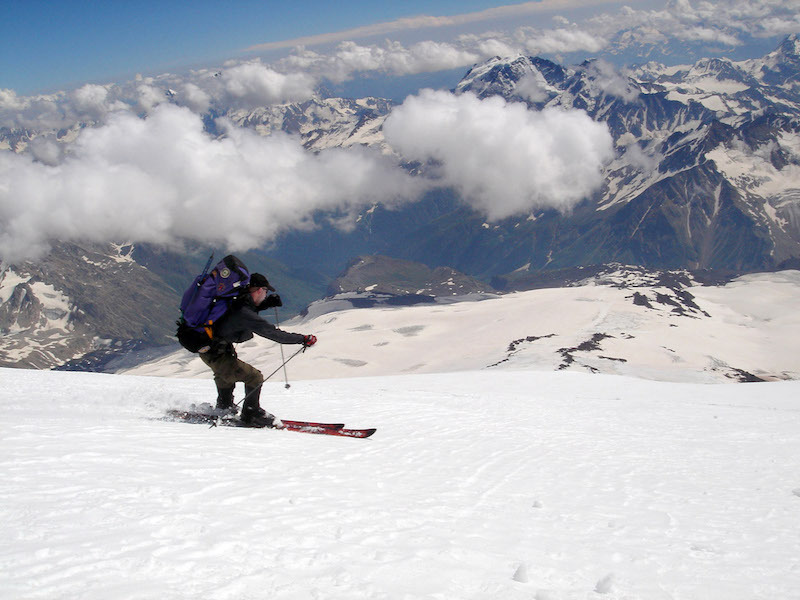 Can you ski Mount Elbrus? When I summited Elbrus, we hiked up to the ‘Diesel Hut’ (4,050 m) and then skied up to the saddle just below the summit before climbing the rest of the way, and then skiing back down to the Diesel Hut. If you’re capable, it adds a fun dimension to proceedings. Summit day is tough. You ascend around 1,592m and you’re on the go for around 15 hours. That’s hard no matter how fit you are. When we got back to the Diesel Hut we then realised someone had stolen our stove, and as there was no running water, and no-one else there, we had no way of melting snow to drink. We could also see a major storm approaching – and it looked bad. In the end, we had no option but to continue descending through the night. And at that point we’d already been on the mountain for around 18 hours. It was a brutal couple of days, and had we been caught out in the storm I dread to think what might have happened. Whatever you do, don’t be lulled into a false sense of security. 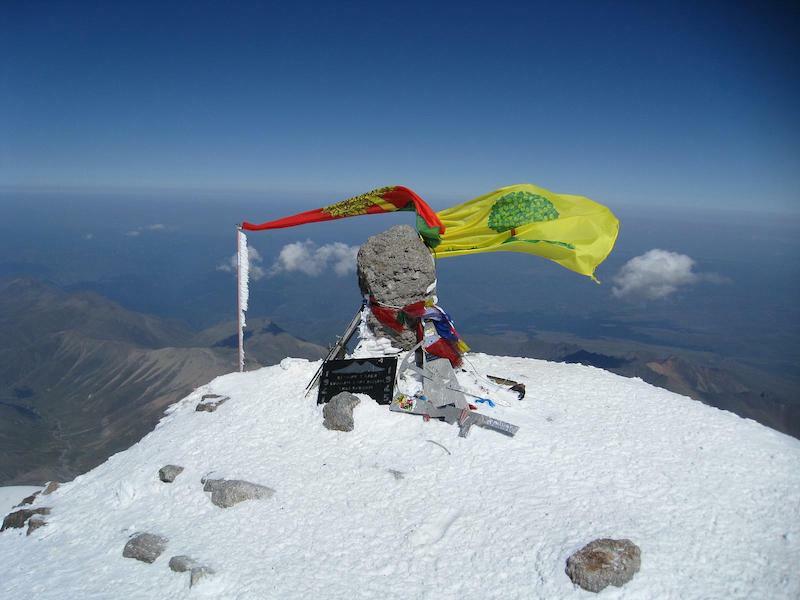 Mount Elbrus is the high point of Europe – it’s no pushover. Jim Mee is a keen runner, mountaineer, and explorer of the world’s wildest places. He’s the founder of UK firm Rat Race Adventure Sports and has pioneered new events in Panama, Namibia and Mongolia. He’s also a father-of-two who’s passionate about introducing children to the wonders of the great outdoors.